Michael Suddard: Half Price Quiznos Sub? Sure I'd Bank on That! Half Price Quiznos Sub? Sure I'd Bank on That! The previous week, I received a few Quiznos coupons in the mail. 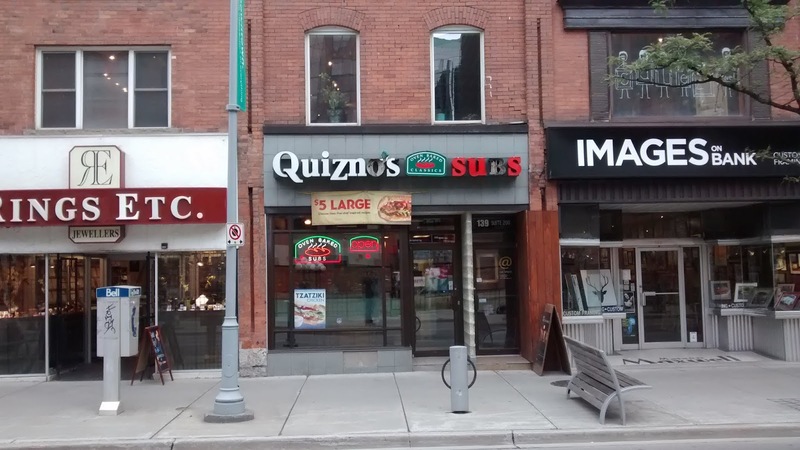 So Friday for lunch I stopped off at Quiznos (139 Bank Street, Ottawa) in hopes of eating a nice sandwich. I walked in at 11 A.M. to see one employee behind the counter who inquired what I would like to order. After perusing the menu and reading the fine print on the coupon I was ready. The Order: The Traditional Sandwich (Roast beef, Turkey Breast, Honey-Cured Ham, Cheddar, Tomato, Lettuce, Red Onion, Black Olive, Ranch Dressing) with a fountain Coke. The employee made the sandwich and zipped it through the conveyor belt oven and pulled it out on the other side ready for vegetable toppings. After that I was off to attempt to retrieve my drink. At the drink machine I filled my glass with ice and tried the Coke dispenser. Nothing, not even a drop. I looked back at the employee and explained the situation. The employee said he forgot to turn the fountain machine on, I just needed to turn the machine on. A turn to the right and the machine was on! The Coke fountain worked and I was off. Who knew you had to turn on the machine? I guess this method is to ensure any unscrupulous overnight employees don't abscond with unpaid for or untracked fountain beverages of any type. I sat down in the front window and reviewed the sandwich. Looked well put together with little extra toppings to slip out. The sandwich was delicious with a little melted cheesy taste to it. Add in the the cooked meat and this sandwich could become one of my favorites. Overall, for a six dollar and change meal it wasn't too bad. Minus the fountain drink fiasco, it was a pretty good lunch for the price paid.